French physician; born at Paris March 9, 1862. From 1886 to 1888 he devoted himself to public demonstrations of the researches of the faculty of pathological anatomy, and during the two years following was in charge of a course in bacteriology in the laboratory of Professor Cornil. In 1895 he was appointed visiting physician to the hospitals of Paris, and in 1904 became an instructor in the faculty of medicine. He is now (1905) physician to the Hôpital Cochin, and is in charge of the medical clinics at the same institution. 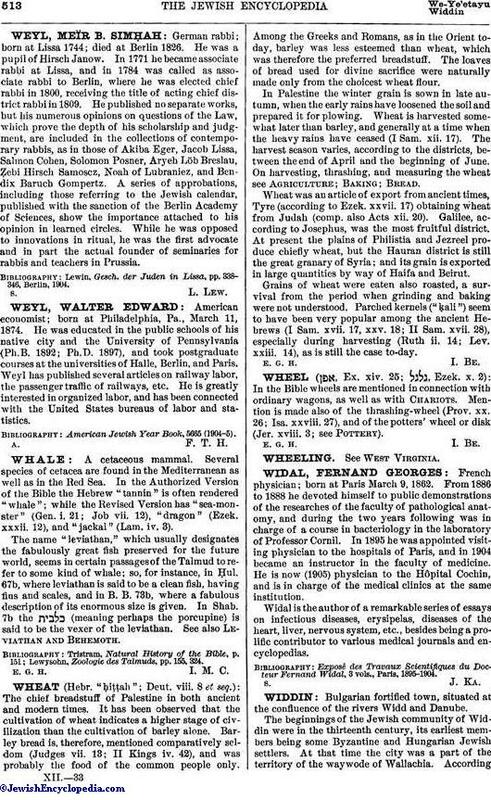 Widal is the author of a remarkable series of essays on infectious diseases, erysipelas, diseases of the heart, liver, nervous system, etc., besides being a prolific contributor to various medical journals and encyclopedias. Exposé des Travaux Scientifiques du Docteur Fernand Widal, 3 vols., Paris, 1895-1904.